In 2018 the market is not short on great mechanical keyboards under the £100 price point; especially with companies like Corsair, Logitech, FNATIC and Cooler Master having strong contenders. The AORUS K7 will have to do a great job to set itself apart from the pack, and it does make a good first move. Swaying away from plastic for the top fascia, the K7 offers a metal one which looks and feels quite premium. Things like the highly adjustable feet stands, and on-the-fly controls do also help its push to differentiate itself. The AORUS K7, however, strives to do one main task above all else and that is to provide a great gaming performance. It starts off strong as it utilises genuine Cherry MX reds which offer a responsive and quick experience thanks to the short 2mm actuation point and 45g actuation force. 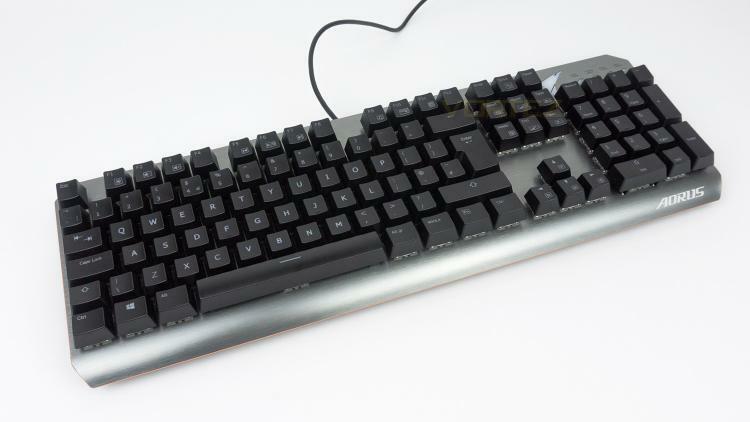 The K7 also makes use of GIGABYTE’s matrix key-switch design that enables it to provide anti-ghosting across all areas of the keyboard. N-key rollover is another strong addition that K7 posses as well as media controls and controls for the RGB illumination. For lighting the AORUS K7 uses GIGABYTE’s RGB Fusion combined with their AORUS Engine software which enables per-key customisation and up to 16.7 million colour choices. The AORUS Engine software is compatible with a wide range of GIGABYTE products; this means you can create a nice ecosystem for your setup if you use compatible products. GIGABYTE shares the same passion for gaming as all gamers. Therefore we have extended the premium gaming brand - AORUS, the pinnacle of our hardware excellence, to provide a full spectrum of innovative gaming products that deliver the ultimate performance and exemplify PC’s capability of bringing gamers unprecedented delights. We continue to participate in global gaming events, connect with the community and actively listen to gamers’ desires in order to create marvelous products that are focused on gamers’ needs. AORUS is a team of gamers in the PC industry, looking to side with gamers on the gaming conquest, to challenge the limits, and become legendary.